Lawrence was also an oasis for many of us suburbanites in the Wonder Bread basket. One of the beige bedroom communities near where I grew up is the birthplace of Applebee’s. Enough said. Lawrence, by contrast, was a Midwesterner’s hipster heaven. It wasn’t exactly a holy city, but teenagers flocked to Lawrence as if it were an indie Canterbury. Vintage clothing stores, New Age boutiques, ratty used bookshops, and rock venues/dives line its famous Massachusetts Street. The University of Kansas’ KJHK has long kept listeners up to speed on the latest from labels like Drag City, Sub Pop, Cherry Red, Matador, and Thrill Jockey. Merge Records’ very own early 90s lo-fi shamblers, Butterglory, played gigs at the stale-beer-soaked, legendary Bottleneck. Other groups also set up shop in this lively little town. So did William S. Burroughs. Left field cartoonist Travis Millard, a fellow Olathean, painted grotesque murals on the walls of the shabby pinball palace, Replay Lounge. Youngsters from the exurban outreaches of Kansas City and beyond still make their pilgrimages to Lawrence. Many of those visitors are on the hunt for records. Like me, they made sure to visit the local shops, browsing the bins and trying to track down sub-nuggets garage rock, tropicália, or the latest records that the pointy-headed reviewers at Puncture magazine had rhapsodized about. For all of this, Love Garden Records was, and still is, the place to go. It’s a Nepalese vinyl temple of rock, pop, r&b, and honky tonk. Instead of temple monkeys, Love Garden is populated with a clowder of fat cats, basking in the sunlight that pours through the dirty windows. These felines barely move a muscle as White Fence blares over the speakers. Recently, when I’ve made my pilgrimage back to Love Garden, I still find myself searching for unknown legends of the psych rock era or some 70s, definite article power pop band—The Toms, The Spongetones, The Shoes—that a friend of a friend has recommended. But now, especially since I’ve started writing about Jesus rock and Christian psychedelia, I also keep my eyes peeled for religious music, long forgotten Christian folkies or Pentecostal imitators of Bread. And, if I’m really lucky, maybe I’ll score an LP of some anti-rock preacher like Jack Van Impe or Sketch Erickson. I couldn’t believe what I picked up at Love Garden in July 2013. The collage on the cover looked like an acid-induced, world religions free-for-all. 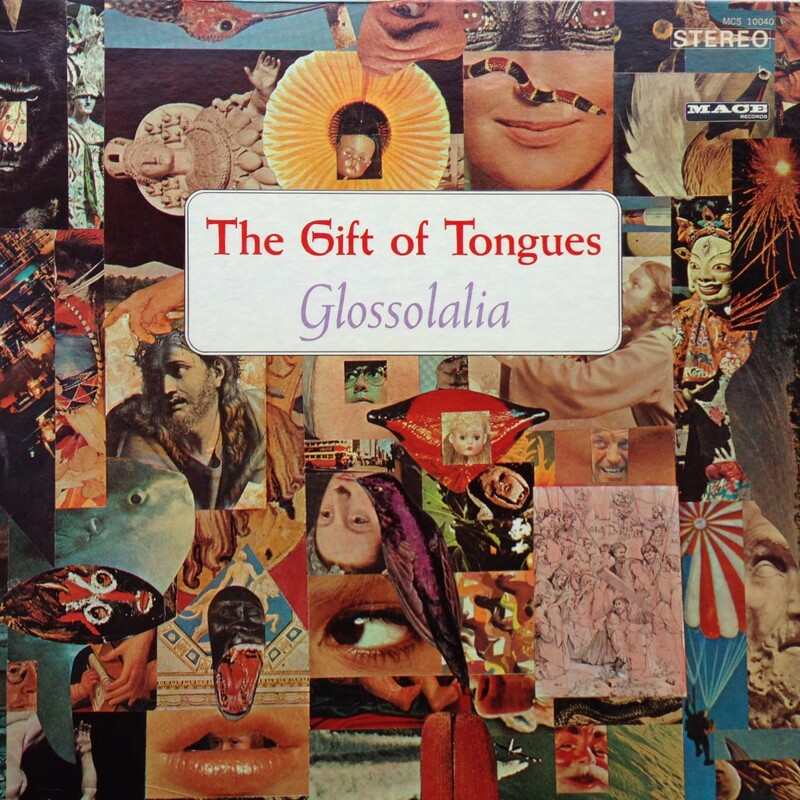 The title only added to the confusion: The Gift of Tongues: Glossolalia. As I set the needle on the record, I wondered if it would be to prayer what draw-this-turtle-and-pirate-and-prove-you’re-an-artist is to art school preparation. Who ever heard of a how-to-speak-in-tongues record? But it was not exactly a how-to guide. It’s unclear exactly what it was intended to be. An anonymous man speaks, sings, and drones in tongues, in what sounds like a cavern or an empty hall. Spare stuff. It would top the charts of any late-night, public radio, found records show. This bizarre find encapsulated my interest in record bin browsing and buying—I was intrigued by the strange look, the title, and really curious about the contents. I have seldom seen prayers on vinyl like this. 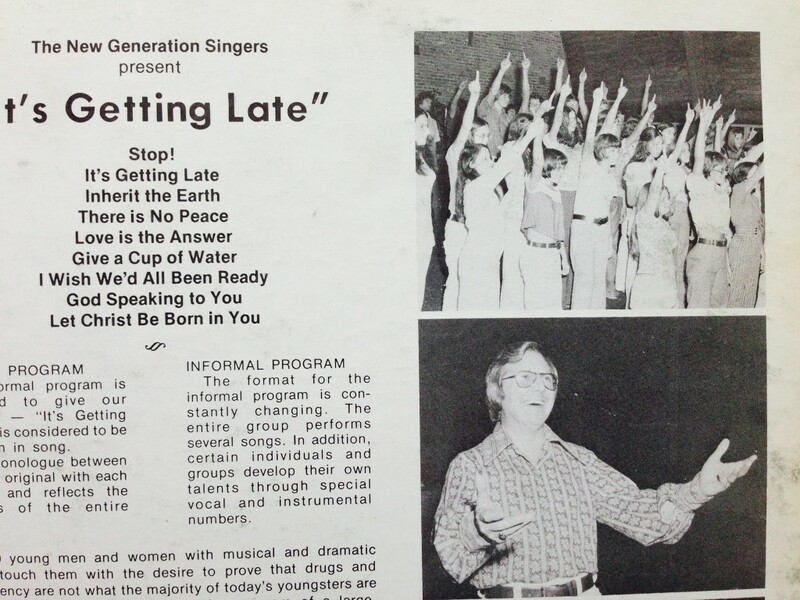 But I have seen plenty of records by church choirs, subpar Jesus rock groups, Christian college folk outfits, and countless other forgotten evangelical ensembles from yesteryear. The record wonks at Love Garden curate their collection. No one does the same at the area thrift store, and this is where you often find choice Christian records by: A middle-aged white women ventriloquist who preaches alongside her puppet, a pastor who moonlights as a singing gospel clown, a Christian magician. A puppet might lead the sinner’s prayer. In a sense, these records—many from the born again/me decade—are like prayers in their own right. Such records were produced in makeshift studios, pressed in small runs (perhaps 200 to 500), and then sent into the world like vinyl missionaries in hopes that they would reach the unsaved or buoy the faith of the faltering. You can look at the sincere pictures on the back and the oversaturated or molded color photos on the cover and feel the yearning. John Modern notes in the intro to his portal that “vinyl records foreground the materiality of sound, insisting on a spiritual essence that is wholly tangible.” Hunting for, purchasing, and playing these scratched and scuffed Christian records from the denim and polyester era helps me, in some sense, bridge the past. I hear the petitions and preachments of those who produced them. It all continues to fascinate. Few LPs will throw up as many question marks as the undated The Gift of Tongues, yet most will give me a window into the hopes and desires of the faithful.